Thank you for visiting the Esk Cottage website. We hope you find the holiday accommodation on offer appealing and look forward to hearing from you should you decide to book with us. 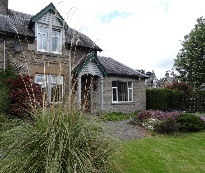 Esk Cottage is an attractive, Victorian built, semi-detached house in the picturesque town of Pitlochry. It is situated in a quiet location beside the Church of Scotland and very close to the town centre, where there are a variety of shops and facilities. The house has a south-facing garden to the front and private parking at the back. There is gas central heating throughout. Both external doors and all windows are double-glazed and have security locks. It is non-smoking and pets are not permitted. Bookings are generally Saturday – Saturday, although short breaks will be considered, mainly off–season. The accommodation offered is on two levels. On the ground floor there is a comfortable lounge overlooking the garden. This room has a feature electric fire and bt-tv essential, with sports channels and dvd player. There is a separate dining room next to the lounge. Also on this level is the kitchen which is fully equipped with the following: electric hob/oven, microwave, toaster, kettle, washing machine, fridge, utensils and crockery. On the upper level there is a double bedroom, a twin room and the bathroom, where there is an electric shower, a bath and an electric shaving point. All linen and towels are provided. A travel cot is also available. Esk Cottage is now equipped with wi-fi which is available free of charge to our guests. A garage is located at the back of the property and can store bicycles, ski equipment and canoes etc. A small freezer and tumble drier are installed here too. Pitlochry, in central Highland Perthshire, is in an area known for its stunning scenery, high mountains, lochs and beautiful woodland/hill walks. There are a number of local attractions such as the Festival Theatre and the Hydro Electric Dam and fish ladder. There are also two local whisky distilleries, Edradour Distillery and Blair Athol Distillery. The House of Bruar, Blair Castle and the Queen’s View are all close by and can be reached by car or by local bus service. Guests can learn more about various places of interest from brochures available in the cottage, or visit the local Information Centre where staff will assist. The Highland Perthshire Ltd website www.highlandperthshire.org has excellent details of what to see and do in the area and where to eat and drink. Come and see what Highland Perthshire has to offer!